Virtualization introduces new dynamic dependencies – between physical machines and virtual machines (VMs) and between VMs. These dependencies make it quite complicated to monitor and manage virtualized infrastructures to ensure service performance and business continuity. For virtualization initiatives to be successful, it is critical that end-users see the same, or better, performance from virtual infrastructures as they had experienced with physical infrastructures. Since a single Red Hat Enterprise Virtualization (RHEV) server is used to host multiple VMs, a single malfunctioning application on a VM can degrade the performance seen by applications hosted on the other VMs that share the underlying resources of the physical machine. To troubleshoot this infrastructure, monitoring solutions need to understand the inter-dependencies – between applications and VMs and between VMs and physical machines. Making the problem more challenging is the fact that in a Red Hat virtualized environment, VMs (and hence, applications running in these VMs) can be migrated from one physical machine to another. eG Enterprise is a comprehensive solution for monitoring and managing all aspects of the KVM hypervisor and the RHEV guest VMs, whether the infrastructure is used to support server or desktop applications. To enable administrators to control the user experience in virtualized infrastructures, eG Monitor for RHEV provides the industry’s only virtualization-aware service topology mapping and automatic correlation. This allows administrators to monitor the virtual infrastructure not as a silo but as an integral component of the overall business service infrastructure. 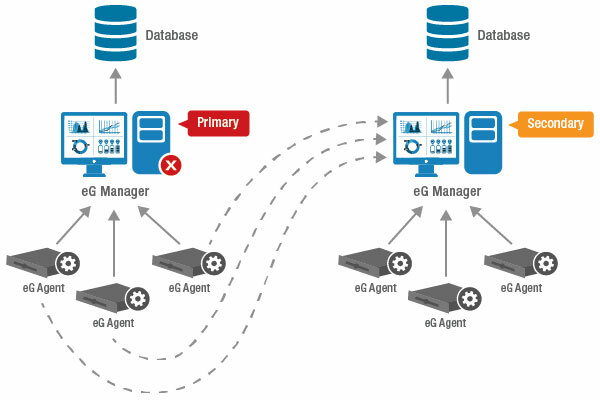 eG Enterprise correlates performance across the RHEV server and guest VMs. Automatic virtualization-aware root-cause diagnosis enables administrators to rapidly identify bottlenecks and to right-size their infrastructure for peak performance. Administrators can not only determine if specific Virtual Machines (VMs) are consuming resources, they can also drill down to determine why these VMs are taking up resources (i.e., which applications are responsible for this). Coupled with the ability of the eG Enterprise Suite to monitor 180+ applications, including Citrix, Oracle, IBM, SAP, and others, the eG Monitor for RHEV provides a true end-to-end solution for monitoring and managing the performance of heterogeneous virtual IT infrastructures.